Oh, baby! Sit down and strap in cause I promise you this series has the fastest first 12 episodes of your life. Which afterwards it just slows down. Yeah that’s pretty much the best way I can describe this series. Parasyte – The Maxim – it’s so pulse-pounding and adrenaline pumping that you just keep watching and watching without really stopping. Even though this series only has one season and doesn’t really deliver a conclusion nor does it have an admirable climax I feel that all the build-up you feel in the beginning leaves you with questions unanswered that keeps you from putting it down. I guess that’s the kind of questions that remains when the villains of series are just as vulnerable as the protagonist. Or so it is believed to be by some. Even for the ones who are truly invincible, they hardly pose as appealing villains with believable motivations. No matter how small or how big their origins it seems everything and everyone are so small and insignificant. Aliens are no different from humans so it seems. 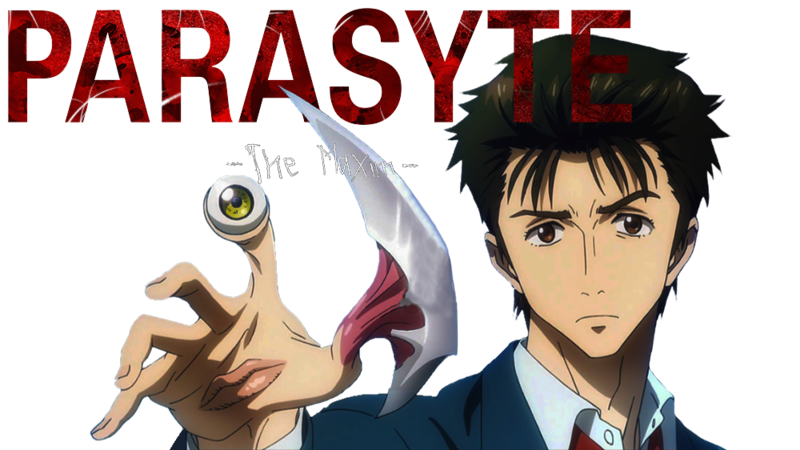 Parasyte – The Maxim- takes place in modern day Japan. With the looming threat of what starts out as a zombie invasion but later devolves into an extermination plot. To be clear the series is actually a lot more enjoyable in the earlier episodes than the later ones. But this series takes the unfortunate route of killing off nice characters. The waifu of this series for me actually died which I found very disheartening. The supporting actress, though a Mary Sue, actually redeems herself, albeit in the last episode of the series, but hey better late than never. This series will be dearly relatable to some but could also make others feel incredibly uncomfortable. The gore while animated is still gory and the imagery in the series can cause nightmares in the youngest of kids. It’s very much a PG-13 show, which is fine in the sense I mean I’m halfway surprised there’s not an excessive amount of swearing given the amount of violence and gunfire. But oddly enough in the conclusion of this series, it takes a much more philosophical turn. Questioning how the aliens or parasites, as they are called, are any different from the humans. When animosity and murderous intent are the only emotions that bring up since it seems fitting, that when a new feeling is felt, no one knows what to think of it. Perhaps it is a feeling that vanished when someone died. I think you’re getting the gist that not many of the characters are enjoyable in the story. But that’s okay because the message behind it is one pretty much everyone asks themselves in their early adolescent lives. For the people that are lost or confused or have lost a loved one, this series might hit home a little too hard. For those that are lively and want some popcorn action drama, this one will be for you. Don’t expect any character to leave a lasting impact on you except probably the one that goes to sleep a lot. And while that might seem strange to say I assure you it’s all a part of a learning process. Overall the speed and pacing of this anime are well played, incredibly enduring, and wonderfully set-up. There are obvious time breaks in between and while not everyone will get their own backstory it’s nice to see a clear focus on what our heroes want to accomplish so dearly. Because if there’s one thing this anime succeeds at the most it’s showing a clear fight for survival. A true depiction of natural selection and survival of the fittest. Everyone likes to believe all life is sacred, everyone wants to keep creating and building bigger and bigger, but when people refuse to see that you can build a bigger and stronger human it’s shunned and discredited. I actually laughed when they referenced “the Americans” as people who want to study the parasites for medicinal and weapon purposes. Japan always portraying us as the enemy gets old sometimes, but it’s a great nod to history. So I leave you with this, choose your path, good or evil, life or death, find your purpose watching this anime. Because without one you really won’t enjoy it all that much. For me, I just wanted to see how it would end because it’s all one season. For others, people will want to see it for the action and animation. But if you’re coming in for the story or the characters then leave because there’s only one guy that matters, you’re dominant hand. The one you always trust to do the right thing in the end. Look out for yourself and look after others, be yourself and never forget who you are. And when your tears finally dry up I promise you’ll be in a better place.